Pérez Art Museum Miami (PAMM) presents Christo and Jeanne-Claude: Surrounded Islands, Biscayne Bay, Greater Miami, Florida, 1980-83 | A Documentary Exhibition, an exhibition of archival materials and artworks around the renowned artists’ site-specific 1983 installation, Surrounded Islands, in Miami’s Biscayne Bay. On view from October 4, 2018 through February 17, 2019, the exhibition commemorates the 35th anniversary of Surrounded Islands—an anniversary that also coincides with the founding of PAMM’s predecessor institution, Center for Fine Arts. 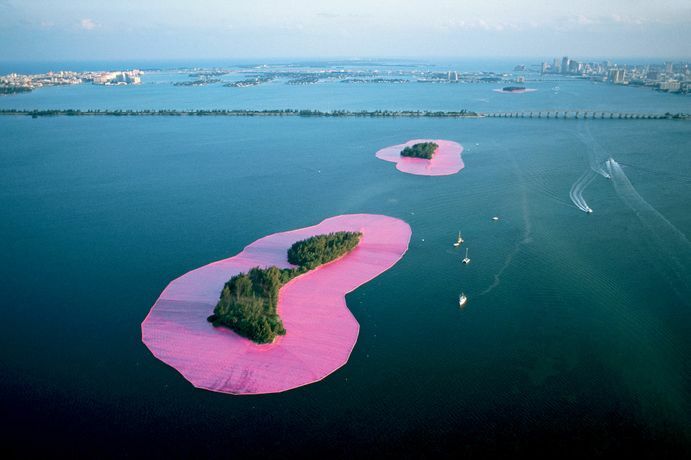 The history of Surrounded Islands is inseparable from PAMM’s origins, and the exhibition reinforces the idea that the museum’s evolution is inextricable from the development of Miami as both a city and an artistic hub.